In the following, I want to share some recent bibliographical findings and musings about William Le Queux. While planning the Invasion Network’s forthcoming special issue on Le Queux in Critical Survey, I committed myself (rashly) to trying to establish the veracity of the often-cited, but never substantiated claim that The Invasion of 1910 (1906) sold over a million copies. [i] Harry and I suspect that the source may in fact be Le Queux himself in the propaganda ‘exposé’ German Spies in England (1915), which, given Le Queux’s reputation for embellishing, would cast doubt on the claim. We intend to publish the full findings on this in a bibliographical note to accompany the special journal issue, but for the moment, here is some of what I found out on a recent research trip to Melbourne. Le Queux is well represented in the catalogue of the State Library of Victoria in Melbourne, speaking to a readership there, with colonial and Melbourne-published editions of his work pointing to his sales potential. The library contains one London-published Macmillan colonial edition of The Invasion of 1910, dated 1906 and noted as the 5th impression on the title page, implying it went through 5 print runs in this format in its first year, the first one issued no earlier than late July/August. Most of the rest of the Le Queux works in the catalogue are propagandist fictions and tracts from the First World War years, again indicating the wide dissemination of his scaremongering and its possible implication in the propaganda wars for Australian volunteers and the Australian conscription debate. These works include the small, cheap, pamphlet-style exposés Britain’s Deadly Peril (London: Stanley Paul, n.d. ), German Spies in England (London: Stanley Paul, n.d. ) and The Way to Win (London: Simpkin, etc, n.d. ), the latter written in March 1916 and predicting Britain’s ‘coming victory’ just months before the Somme campaign began. Also present is a Melbourne-published version of The Secrets of Potsdam (Melbourne: Melville & Mullen 1917); this was a ‘startling exposure of the inner life of the Courts of the Kaiser and Crown-Prince’ purportedly revealed by the German informant Ernst Von Heltzendorff and ‘chronicled’ by Le Queux, but reading more like fiction than some of Le Queux’s most sensational fictional texts. Also present is the large, luxury volume The War of the Nations: A History of the Great European Conflict, vol. 1 (London: Newnes, 1914), which is full of on-location photographs and dramatic, specially-commissioned illustrations. The irony of commissioning someone as pathologically indisposed to telling the truth as Le Queux seems to have been to write a ‘history’ seems glaring; on the other hand this mendacious tendency made him the ideal candidate to produce propaganda, as The War of the Nations in essence was. Like the small tracts, it is full of Le Queux’s favourite scaremongering hobbyhorses – the presence of an advance guard of German spies in Britain (and also in Belgium); the dastardliness of the ‘War Lord’ Kaiser’s long plans for war cloaked beneath a rhetoric of peace; endlessly exaggerated versions of German atrocities in Belgium – not just sanctioned but explicitly ordered for tactical purposes by the Kaiser; and of course, on the other hand, the heroism of the ‘splendid’ Tommies. These ‘factual’ texts are accompanied in the library catalogue by a fictionalisation of the same themes in At the Sign of the Sword: A Story of Love and War in Belgium (London: Jack, 1915), the title pretty much summing up the plot, in which the heroine falls into the hands of the Kaiser’s drunken, barbaric ‘hordes’ and is on the point of ‘ravishment’ before her timely rescue by the dashing Belgian officer-hero. Many of the war-time works highlight on their title pages and front matter the fact that Le Queux was the author of The Invasion – this was the successful abridged version of The Invasion of 1910 published by Newnes in 1910. This reissue and the fact that Newnes chose Le Queux as the sole author of The War of the Nations, a well-finished volume that must have been expensive to produce, again testifies to the lasting impact and selling power of The Invasion of 1910. The pamphlets seem to have sold well also: the front matter in The Way to Win in early 1916 notes the sales of 120,000 copies of German Spies in England and 14 editions of Britain’s Deadly Peril by that date. Le Queux at this point seems to have been a one-man propaganda machine, and, given the number of publishers churning out his war pamphlets and fictions, one considered profitable by the industry. It is also worth mentioning that the works mentioned here are just a selection of the very many more similar works Le Queux produced during the war years, and hence, even though he reused material considerably between them, he must have been working at a frantic rate. Other interesting holdings are a Melbourne-published edition of Le Queux’s Rasputin the Rascal Monk (Melbourne: Melville & Mullen, n.d. ) and a Melbourne-published edition of George Chesney’s The Battle of Dorking (Melbourne: Robertson, 1871), ‘Reprinted from Blackwood’s magazine for May 1871’, and available online at http://handle.slv.vic.gov.au/10381/247557. [i] The usual source for this claim is I. F. Clarke, but Clarke doesn’t give his source, see the Introduction to The Battle of Dorking and When William Came (Oxford: Oxford Popular Fiction: 1997), p. xvii. We are delighted to promote the below conference co-organised by Peter Keeling, an Invasion Network member and blog contributor. Eleventh months on from our inaugural conference, the Invasion Network met at Lancaster University on 2nd May to discuss ongoing research and future projects. Hosted by the Head of Lancaster’s Department of History Mike Hughes, attending IN members included Ailise Bulfin, Michael Matin, Pete Mills, Tony Taylor, and Harry Wood. The primary topic of conversation was ‘Literature and Propaganda: William Le Queux, Invasion Scares and Spy Fever, 1880-1920’, a special edition of Critical Survey showcasing the research of the network and due to appear in mid-2017. This collection of essays will interrogate and interpret Le Queux’s life and legacy from a variety of scholarly angles, and the meeting offered an opportunity to ensure the contributions are developing in a coherent and interconnected way. Unifying research questions include the idea of Le Queux as a ‘populist’, the extent of his role (both quantifiable and subjective) in encouraging invasion anxieties, and the challenges of analysing a figure who left such a small archival footprint. Having now set deadlines for drafts and established group editorial procedures, ‘Literature and Propaganda’ is moving in an exciting direction. More details about this event will be available very soon, starting with the confirmation of a keynote speaker. The workshop will be aimed at all levels of academic scholarship, and we are especially keen to receive paper proposals from postgraduate students and early-career researchers. We closed the meeting by thanking Mike Hughes for his hard work and hospitality in hosting the event, and expressing our excitement about the future of this young research network. We look forward to our next event in 2017 in which both the remit and the membership of the IN will be broadened. A panic was a short period of high-profile public, political and media interest and anxiety in the state of the national defences, usually sparked by a particularly influential, convincing, and pessimistic article or speech, condemning some deficiency, real or perceived, in the Army or Navy. By the 1880s Britain already had a long tradition of such events; the 1840s and 1850s saw three major ‘panics’ resulting from fears of French expansionism, the last and most severe of which in 1859 resulted in the construction of a large number of expensive fortifications along the South Coast and the formation of a nationwide Rifle Volunteer movement. During the last two decades of the century, historians identify significant panics or scares in 1882, 1884, 1885, 1888, 1893 and 1900. During a ‘panic’, or so the narrative had it, the usually apathetic public would ‘wake up’ to its defenceless condition, demand, with ill-thought out haste, the laying down of some new ironclads or the erection of fortifications, and, after a few weeks, retire back into its indifferent state, having added only inefficiencies to the defences and fresh burdens on the exchequer. ‘Panics’, continued Carnarvon ‘produce bad work and expensive work.’ The very use of the word itself is significant: in the wider political, sociological and economic discourse ‘panic’ was closely related to the two contemporary bugbears of the governing class: riot and financial collapse. Gladstone’s perspective suggests an explanation not only for Lawley and Carnarvon’s assumptions of widespread anxiety, but also those of historians. By focusing on the easily accessible fears of selected political, military, literary and social circles – fears which emphasised the domestic ‘mob’ as much as foreign invaders – historians have at times failed to recognise the fact that defence remained a subject of little concern to the nineteenth century electorate. [vii] In doing so, they have risked inflating a minority interest into a ‘national obsession’. This is not to dismiss the subject of late nineteenth century invasion fears out of hand, however. Regardless of the facts, many elites continued to believe that the British were a people uniquely susceptible to defence panics or scares. This was especially true of those on the political right who would go on to form the backbone of twentieth century organisations such as the Navy League or the National Service League. For these people the narrative of panic formed an important part of their propaganda, which regularly argued that only naval supremacy or conscription could prevent not only invasion, but also the disorder consequent of scares and panics. In this way, the misremembered scares of the nineteenth century served to encourage the alarmist agitators of the twentieth. I am delighted to report that three members of the network will be speaking at the Social History Society annual conference at Lancaster University next week (21-23 March). The panel details and abstracts are included below. Please make an effort to come if you are attending the event. Chair: Professor Michael Hughes, Professor of History and Head of Department, Lancaster University. Peter Keeling, University of Kent. Peter is a PhD student working on British fears and anticipations of invasion between 1880 and 1904. Dr Harry Wood. Harry is a postdoctoral researcher looking at the cultural history of British invasion anxieties, with a particular interest in invasion-scare fiction, and authors including William Le Queux, James Blyth, George Griffith, and H. G. Wells. Harry Richards, Keele University. Harry is a PhD student analysing the extent of spy fever during the First World War and its influence on the regulation and policing of British society. This panel challenges the assumption that British society was widely included within the observable ‘invasion scares’ of the late nineteenth and early twentieth centuries, and instead seeks to analyse how individuals perceived the threat of invasion. While invasion panics have often been linked to late Victorian and Edwardian attitudes towards security and immigration, the popular acceptance of such concerns has only received superficial treatment by historians. Harry Wood asks whether Edwardian invasion panics were genuinely ‘popular’ in nature. Examining the political and cultural roots of pre-1914 invasion scares, Wood cautions against assuming that such anxieties were widespread, and suggests avenues by which the social history of invasion panics can begin to be explored. Peter Keeling discusses the reaction to panic, and how controlling forces attempted to limit the negative influences of newspaper-driven alarm. Keeling contends that regardless of the actual extent of these scares they significantly influenced contemporary views of popular opinion, conditioning politicians to fear popular anticipations of war almost as much as they feared war itself. Harry Richards concludes the assessment of invasion scares by turning to the First World War to analyse the role of local authorities in provoking spy fever, along with the competing mechanisms of criticism and protest that questioned the prevalence of the German spy in Britain during the First World War. In spite of attempts to instruct society to remain cautious and vigilant in the response to the spy danger, Richards argues that many individuals remained indifferent to such rhetoric and viewed the rumours with steadfast derision. By re-evaluating the degree of invasion obsessions, the nature of press-led panics, and the impact of local reactions to ‘spies’, this panel will reflect on the varied emotions and attitudes experienced by the British public over the period 1882-1918. It will examine the construction of ideas attempting to promote anxiety and fear by building on nationalistic sentiment. The chronological analysis will demonstrate the development and manipulation of an idea in a range of different contexts, and challenge the dominant view of Britons as a typically insular race. Public discourse relating to national defence in fin de siècle Britain was conducted within a context of widespread pessimism, with the state of the Army and Navy regularly condemned by ‘experts’ whose words were eagerly disseminated and dissected by the press. On occasion a particularly influential article, speech or international event would whip up a ‘panic’, a period of high-profile public and political interest and anxiety. By the end of the century official attempts to respond to defence panics were considered by many to have destabilised government policy, damaged national finances and spawned an international arms race, without seriously improving either the position of the armed forces or public confidence. This paper examines the ‘newspaper panic’ phenomenon of later nineteenth century Britain as a case study in press power. It argues that, despite the top-down and relatively limited nature of these scares, their prevalence within the press left many contemporaries with the impression that the British were a people unusually susceptible to ‘contagion’ by panic, a weakness which some anticipated would severely hamstring the nation during wartime. As a result, fear of panic became an important motif within both public and official anticipations of ‘the next Great War’, while the prevention of popular panic became increasingly regarded as an important facet of defence preparation, encouraging an anxiety about public hysteria which was carried over fully formed into the twentieth century. Writing in 1968, the historian Howard Moon described the fear of invasion in Edwardian Britain as ‘nothing less than a national obsession’. Pointing to the periodic invasion panics of the pre-war years, the numerous inquiries held by the Committee of Imperial Defence, and the great popularity of invasion-scare fiction, Moon argued that invasion enjoyed a dominant position in Edwardian social and political discourse. This position has remained largely unchallenged in the intervening years, not least within the debate surrounding the outbreak of war in Europe. In Britain and the Origins of the First World War, Zara Steiner and Keith Neilson argue that the same pressure ‘which led men to read invasion stories in the press and to welcome the fictional accounts of war to come’ prepared the way for conflict in 1914. Yet the idea that invasion was a ‘national obsession’ is difficult to justify on the available evidence and research. Based largely on high political crises, newspaper-led panics, and popular invasion novels, historians have rarely attempted to gauge whether these events and cultural products translated into widespread invasion anxiety. In short, the popular reception of invasion fears remains underexplored. This paper aims to offer some thoughts as to how analysts might begin to address this gap in understanding. Examining the value of autobiographical works, newspaper coverage, oral interviews, and a range of circumstantial accounts and stories, it will be argued that the pervasiveness of invasion fears cannot be assumed, and should be critically engaged with. During the First World War, British society supposedly became consumed by a fear of German spies seeking to subvert the war effort. Espionage literature and exaggerated press reports reflected and seemingly confirmed the paranoia. David French has described the panic as a spontaneous eruption of fear caused by the gullibility of the British public, who believed the German spy menace to be a very real and immediate danger. By analysing the distinctions between concern, anxiety, and fear this paper aims to give greater agency to the individual citizen in order to ascertain how people actually responded to the depiction of the spy threat. This paper examines evidence that suggests life continued as normal for many across the British home front during the First World War. Notwithstanding the concern and anxiety that war naturally caused, the public did not spontaneously generate a hysterical fear of German spies hidden throughout Britain. Research into local newspapers suggests that relatively few individuals experienced such fear, despite the prominence the threat received. This paper seeks to readdress the nature of this so called hysteria and analyse how far the appearance of spy fever was an attempt to manipulate a tradition of xenophobia already apparent throughout certain sections of British society. By comparing police precautions with cases reported across Britain, this paper aims to establish where and how the fear of German spies manifested itself, but also, why people appeared to be unaffected by the contagion of ‘spy fever’. Christian Melby’s account of how invasion fiction portrays all four official nineteenth century British nationalities – English, Irish, Scottish and Welsh – as being inextricably bound to each other in the context of future armed conflict fits well with my perspective that colonial factors were very important in the production of invasion fiction (read Christian’s post). Many of the authors of key invasion tales had strong colonial connections, as if their greater exposure to the realities of life among the resentful or even downright hostile populations of colonised nations gave them a greater awareness of the potential dangers of invasion. Just to name a few relevant examples – Erskine Childers’ mother was from what is generally known as Anglo-Irish background, this contested term at very least signalling complex self-identification and divided loyalties, and Childers spent a formative period of his youth in Ireland. 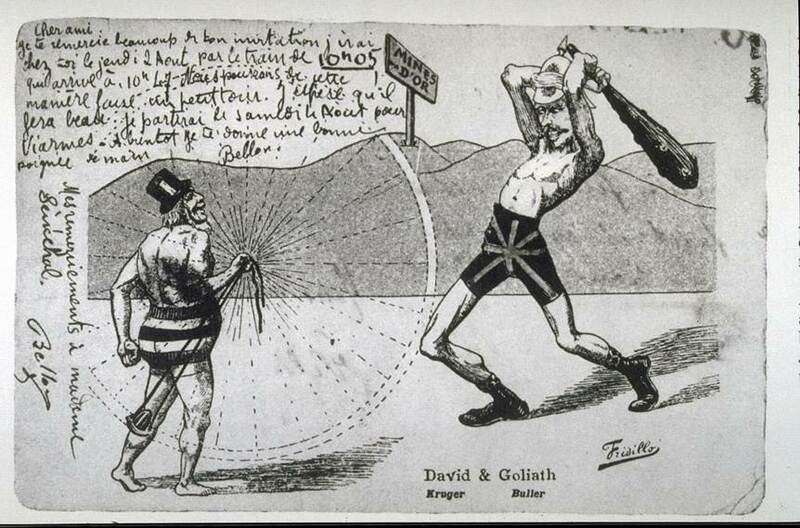 Though any Irishness is largely elided in the quintessential Englishness of the Carruthers and Davies characters of The Riddle of the Sands (1903), criticism of British imperialism yet emerges in Davies’s observation that the British can’t really be too critical of German aggrandisement: ‘We can’t talk about conquest and grabbing. We’ve collared a fine share of the world…’ (2011 Penguin edition, p. 93-4). I think it’s particularly telling that Chesney describes a potential Fenian uprising in Ireland as a ‘Fenian invasion’, showing how conflated the two prospects – European invasion and counter-colonial conflict – were for him. Also of relevance in this context is Northern Irish author Tom Greer’s A Modern Daedalus (1885), in which an Irishman invents a one-man flying device from which bombs may be deployed by hand against targets on the ground. Despite being a supporter of the moderate policy of Irish Home Rule he is forced onto the side of physical force Irish nationalism by heavy-handed British tactics and a squadron of flying Fenians wins independence for Ireland. The action is confined to Ireland but the potential for attacks on the island of England is clear throughout. This piece by Harry Wood (University of Liverpool) comes to the Invasion Network from the archive of his research blog Island Mentalities. Originally posted 14th January 2015. Various scholars have attempted to explain this strange dynamic, in which the experts falter and the amateurs succeed. In Imagining Future War, Antulio Echevarria points to the challenges of assessing the short-term effects of technological change. Authors from the armed forces tend to focus “on the immediate future in an attempt to solve specific problems, usually of a tactical or technological nature.” The amateur visionaries of early science fiction, by contrast, were far less temporally and thematically shackled. Falling primarily into the latter category, Echevarria suggests that the civilian authors of invasion literature made little effort “to ground…forecasts in actual events, or to verify apparent trends.” Crucially, both armed forces professionals and amateur writers used the future “as a means rather than an end”, aiming to shape contemporary military strategy and society through speculative, often opportunistic novels. This final point is particularly important. Edwardian invasion narratives, in my view, are best understood as contemporary records rather than speculative strategic treatise. One example of the genre that aptly illustrates this point is The New Battle of Dorking (1900). This is one of several unimaginatively-named works that directly referenced George Chesney’s ground-breaking short-story The Battle of Dorking (1871). It was written by Frederic Maude, a Colonel in the Royal Engineers and prolific military historian. Maude wrote a series of strategic analyses of the Napoleonic period, including The Leipzig Campaign (1908) and The Jena Campaign (1905). He also wrote several tactical studies, such as ‘Military Training and Modern Weapons’ (Contemporary Review, 1900). Though accepting that such a raid was hardly guaranteed success, Maude argued that “The French have everything to gain and little to lose if they make the attempt”. This, of course, is exactly what occurs in the novel. 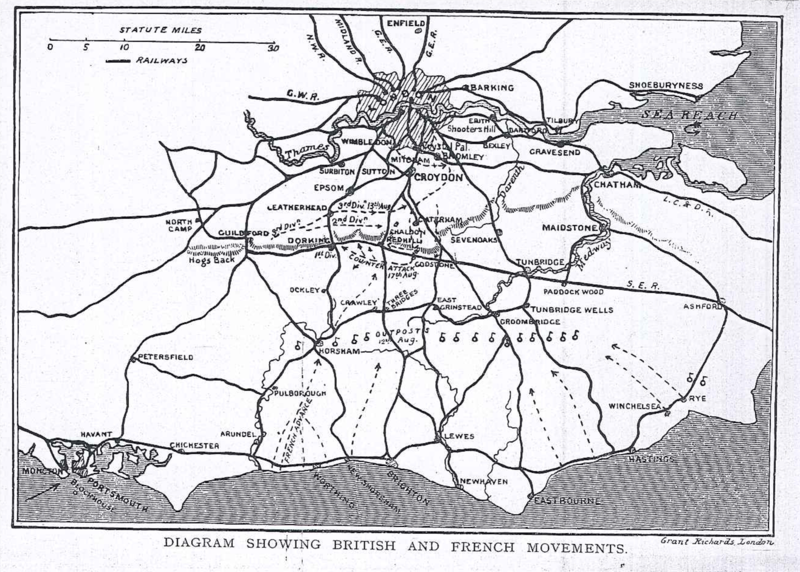 After a torpedo attack on Portsmouth Dockyard, the French land troops at Rye, Hastings, Eastbourne and Worthing. With the Navy on naval manoeuvres off the Irish Coast, and the majority of Regulars fighting in South Africa, the situation initially looks bleak. Yet the French invasion is defeated in less than a week. With the French advance into London halted at Shooters Hill, and a crushing victory won at Chaldon Downs, the final battle naturally takes place at Dorking, where the remaining French forces are convincing routed by a roughshod body of reservists and volunteers. Yet in The New Battle of Dorking we have an outspoken refutation of degeneration fears. Maude goes out of his way to praise the physical and mental qualities of the British forces. Describing an engagement at Guilford, the officer narrator describes “the quite excellent order, discipline, and the smart bearing of the men generally”. “I still felt a thrill of pride”, he continues, “in the sterling qualities of my countrymen. There were few if any loafers in the streets, and those there seemed quiet and resolute”. Turning crude Darwinism to his own ends, Maude christens the men “the survivors of the fittest”. Though accepting that Britain faced major military challenges, he “could not believe that we were as a race really degenerating. It was the fault of our training. Given a sufficient spur and properly led, our men were capable of anything.” Later in the novel, as the British troops sought to retake Bromley, the patchwork force of Volunteers and Reservists “assaulted with an irresistible courage that, under the circumstances, disciplined troops could not have excelled.” The French enemy, by contrast, were “without the moral stamina to stand up to serious reverses, or the physical strength to endure fatigue. Their discipline was the discipline of fear, not of reasoned intelligence”. Britain’s civilians, too, are far superior to their French equivalents. Addressing a crowd at Portsmouth shortly after the outbreak of war, the narrator referred disparagingly to the Paris Commune, and implored to those assembled, “Don’t lose your heads and riot, as the French mob would do”. The significance of Maude’s novel, then, is not in its vision of future warfare, but in its critique of degeneration anxieties. While the genre more broadly was not completely bereft of strategic insight, speculation on the nature of modern warfare was rarely the primary consideration, or focus, of invasion literature authors. Instead of seeking to understand the shortfalls of these military visions, then, historians should arguably seek to contextualise such fiction in the cultural, political, and military history of the pre-1914 period. This post is based on a research paper originally delivered as part of the First World War Research Group Seminar Series at the Defence Studies Department, King’s College London. A. Michael Matin, ‘The Creativity of War Planners: Armed Forces Professionals and the Pre-1914 British Invasion-Scare Genre’, ELH, 78.4 (2011), p. 818-822. A. J. Echevarria II, Imagining Future War: The West’s Technological Revolution and Visions of Wars to Come, 1880-1914 (Westport CA: Praeger Security International, 2007), pp. 96-98. F. N. Maude, The New Battle of Dorking (London: G. Richards, 1900). D. Lowry, ‘Not Just a ‘Tea-Time War’’, in The South African War Reappraised,(Manchester: Manchester University Press, 2000), p. 2. ‘Is England Decadent?’, Saturday Review, 89.2306 (1900), p. 14. Maude, The New Battle of Dorking.